Grown through the western slopes of Sri Lanka, this is a fine wiry OPI tea, which provides a light coloured liquor, a sweet subtle taste and a unique creamy aroma when brewed. A tea which will reminisce the history of Ceylon tea and the beginning of a tasteful journey throughout the world, lighting the lives and uniting those who savour a flavourful cup of tea. 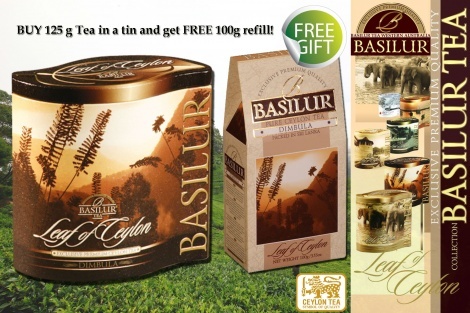 The versatility of enjoying a cup of tea can be highly personal or it could be a shared affair with visitors and loved ones, which ever the occasion, time or place, Basilur has a pure Ceylon tea to offer in different blends and tastes to suit each and every preference and mood. 125g +100 g loose leaf tea packed in flavour-sealed foil pouches with zipper lock into uniquely designed metal tin caddies and carton packets.